So starts the Elvis classic promising bright lights and the certain loss of a bundle of money on the pokies. But as long as you keep your money in your pockets you can have a lot of fun for surprisingly little. For starters you can find some really good accommodation for the cheapest prices we have paid this year. 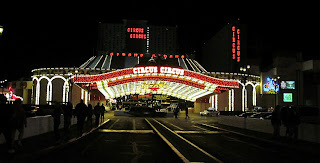 We stayed at the Circus Circus Hotel and Casino, perfectly located on Las Vegas Boulevard (known as 'The Strip') in a huge room with a king size bed, TV, bathroom, etc for the total price of $37 per night. For an extra $10 per night resort fee you get access to the gym and a book of coupons for everything from 2 for 1 meals to discount massages and gambling chips. 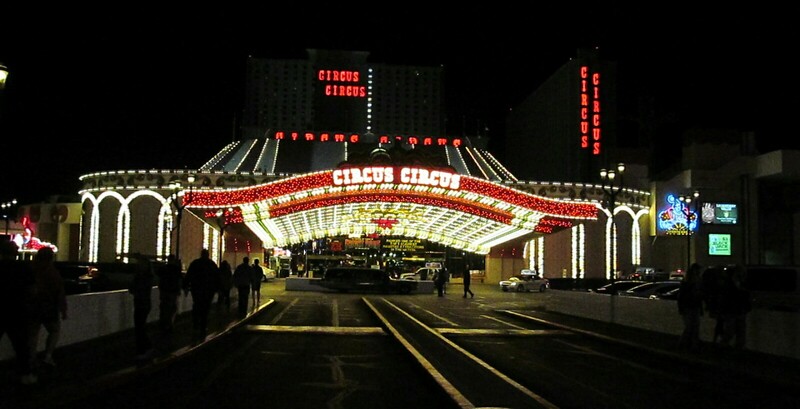 In the middle of the gambling halls they have circus acts performing at regular times throughout the day. During the day we took the long walk down The Strip where you can find hotels and casinos based on a variety of interesting themes. The Venetian is modelled on Venice complete with rides on gondolas going along a lake physically inside the hotel itself. Caesar's Palace has a Roman theme. Paris Las Vegas has its own Eiffel tower. New York New York has all the famous buildings and includes a statue of liberty and the Luxor is a pyramid. All are huge, full of shops and gambling halls. No trip to Las Vegas would be complete without taking in a show. Like Broadway you can get half price tickets for shows available on the day. I really wanted to see a magic show, but the one I wanted to see was not on on Wednesdays. Unfortunately the day we were there was Wednesday, so we went and saw 'Vegas the Show' instead. It was good fun with a bit of everything: impersonators of the famous singers of Vegas like Elvis, can can girls, comedy acts etc. After the show we walked down The Strip towards our hotel taking in a lot of the free entertainment along the way. 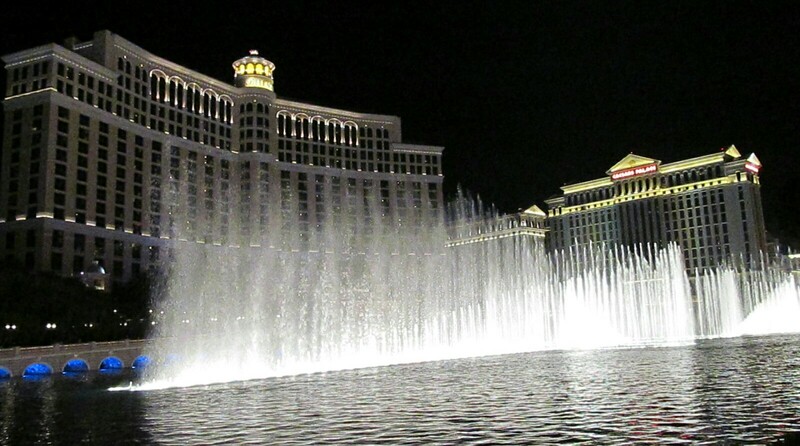 The Bellagio puts on a famous fountain show every 20 minutes, the Mirage has an exploding volcano and Treasure Island had a full on pirate show complete with explosions, music and dance. I suppose you're wondering how much we lost in the casinos... well I can say with dead certainty that we lost exactly 0. I can say that because we tricked the lot of them and did not gamble at all. It was a load of fun and the cheapest time of our holidays; I would be quite happy to come back. You... didn't gamble...? In Vegas??!? I order you to head back to the roulette table immediately! lol, I knew people would find that weird. 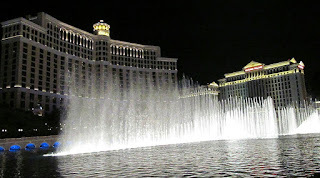 You know how tightly I hold my money, I have gone in many casinos and not taken my hands out of my pockets :-) I suppose i wanted to make the point that you can have a great time in Las Vegas, and really cheaply, without gambling. We really had a great time and want to go back for longer.